an original oil painting on hardboard 16" x 20". Fine art prints are available on canvas or paper in several sizes as well as 5 x 7 inch Greeting Cards. Click Here. 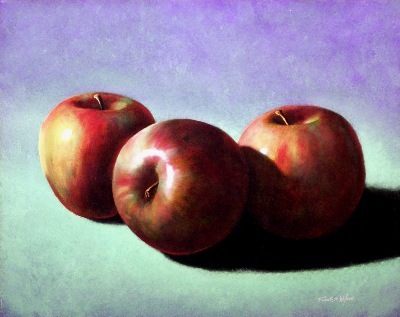 Painted in dozens of thin translucent layers of oil paint. This painting glows with the brilliance of a stained glass window. The pears almost appear luminous. It's all about capturing the light! is a 16 x 20 inch oil painting on hardboard. Prints on canvas or paper are available. Click here. an original oil painting on hardboard 6" x 12". The original painting has sold. an original oil painting on hardboard 16" x 20". The original painting has sold. Prints are available in several sizes on paper or canvas as are 5 x 7 inch Greeting Cards. 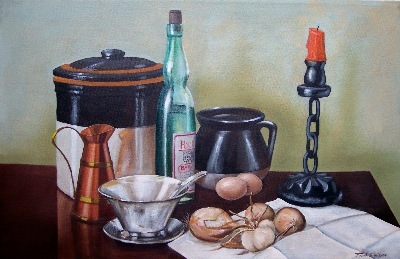 "Still Life With Onions And Eggs"
an original painting on stretched canvas. 13" x 19"
This painting was done in the old world style with thin transparent layers of oil glaze. I'm processing images for below, thanks for your patience! an original oil painting on hardboard 8" x 12"